Graham Firth is a lecturer at Doncaster College where he looks after a First Diploma in art and Design course, he also teaches printing to lots of other courses from BA Fine Art to Fashion Design. He exhibits widely, mainly in the north but has been known to stray as far a field as Germany and Malta and has work in several collections abroad. He also has sold work to various northern health services for their hospital wards. 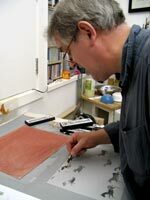 He has also edited books on printing and featured on the cover and inside the London magazine. I am interested in the details of life. I look at my surroundings and record what I see. Most of my recent prints have been based on small doodles in sketchbooks, they are beginning to resemble lists; this has not been a conscious decision. I look on my bookshelves and realise that I keep buying books with titles like "The 500 greatest Films ever made" and "500 Beers to drink before you Die" and I tend to have a pile of them next to me to browse through when I break from drawing, endlessly thumbing through the Mojo lists of the 50 greatest guitar solos. I am also becoming increasingly preoccupied with my past and trying to remember all the small details of what has already gone and wondering how much more there may be. Am I in decline? Can I remember an aerial view of a pub I sat in 30 years ago? Click on thumbnails for larger images and to purchase individual impressions..